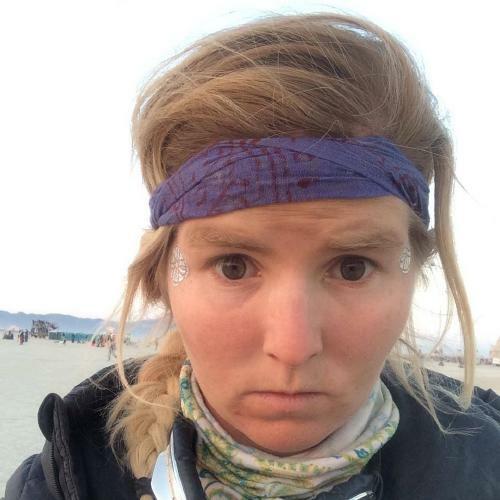 She is online at https://www.facebook.com/profile.php?id=1375650002. 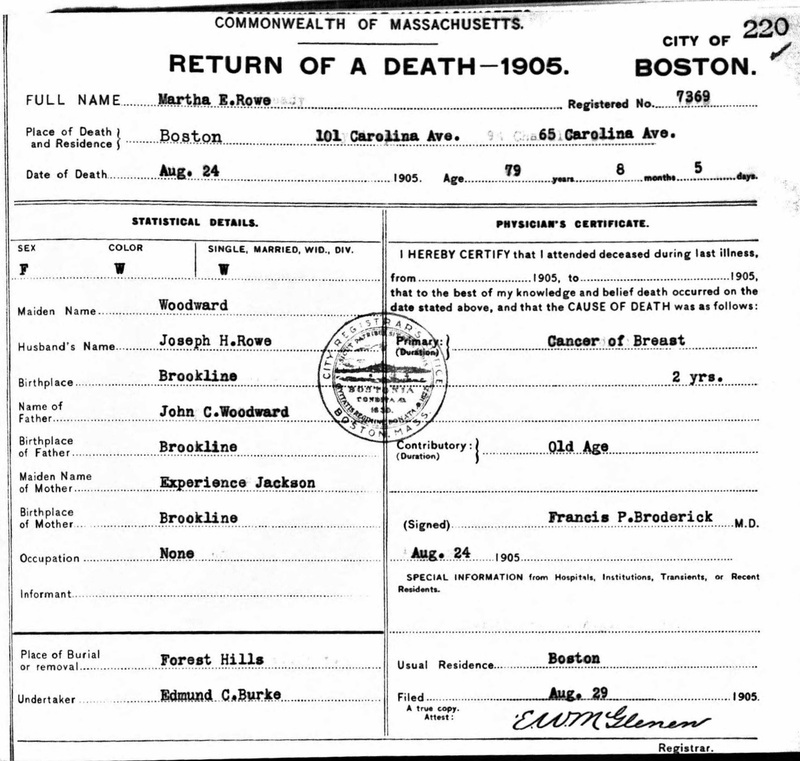 Lucy Jennie Woodward was born on September 28, 1885 in Wilmot, Merrimack County, New Hampshire. Lulu Grace Woodward was born on December 3, 1883 in Wilmot, Merrimack County, New Hampshire. Lydia Woodward was born perhaps about 1694. 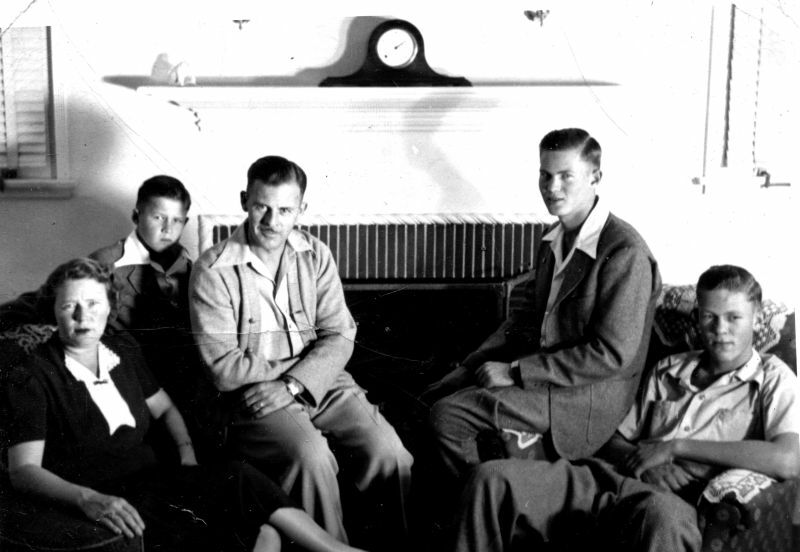 Luther M. Harris, Robert Harris and his descendants, , at https://books.google.com/books?id=t7hRAAAAMAAJ . Boston: Henry W. Dutton & Son, (1861) , pp. 18-9. Father*: Clarence Elliot Woodward b. June 21, 1874, d. 1940;No other children. She was the daughter of Clarence Elliot Woodward and Sarah Bess Seely. living at 501 Highland Avenue, Malden, Massachusetts. living at 41 Maple St., Malden, Massachusetts. Massachusetts Vital Records, 1841-1910, , Vol: 487 ; Page: 12. 1910 United States. Bureau of the Census. 13th census, 1910 population census schedules, Washington, District of Columbia: Bureau of Census Micro-Film Lab, ([19--?]) , Census Place: Malden Ward 3, Middlesex, Massachusetts; Roll: T624_601; Page: 7A; Enumeration District: 894; Image: 820. 1920 United States. Bureau of the Census. 14th census, 1920 population census schedules, Washington, District of Columbia: The National Archives, ([193-?]) 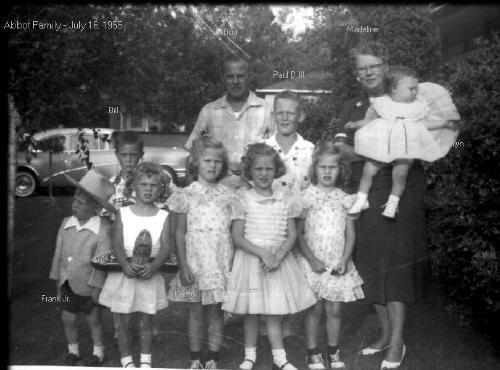 , Census Place: Malden Ward 3, Middlesex, Massachusetts; Roll: T625_713; Page: 5A; Enumeration District: 265; Image: 290. 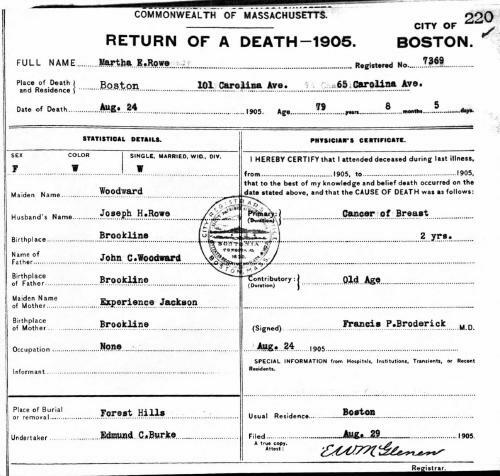 "New Hampshire Death Certificates, 1938-1959," database with images, FamilySearch (https://familysearch.org/ark:/61903/1:1:QV3Q-1TWB : 9 September 2014), Marguerite Irene Fessia, 13 Nov 1958; citing Portsmouth, Rockingham, New Hampshire, United States, p. No 5429-5923, New Hampshire Division of Vital Records, Concord. She was the daughter of George H. Woodward and Cyrena B. Chase. living at 186 Melrose Street, Melrose, Massachusetts. Mary died on February 15, 1963 in Melrose, Massachusetts, at age 76 at a local nursing home after a lengthy illness. Funeral services were held at the Robinson Chapel on Feb 17, with the Rev. Pter Lee Scott of the Unitarian Church officiating. She was employed by the Boston and Maine Railroad until her retirement in 1953. A member of the Pond feilde Club, she was a former member of the Melrose Highland's Woman's Club. She was also active in the Women's Alliance of the Unitarian Church, the Community Associates, and the Sewing Group. Clarence Woodward & family Gravestone, Forest Hills Cemetery, 95 Forest Hills Ave., Boston, Massachusetts; photographed by S. G. Levine. Town and City Clerks of Massachusetts, Massachusetts Vital and Town Records, Provo, UT: Holbrook Research Institute (Jay and Delene Holbrook), , Boston > Births, 1886 > 189. 1930 United States. Bureau of the Census. 15th census, United States, 1930 federal census : population schedules ; NARA microfilm publication T626, Washington, District of Columbia: Bureau of the Census Micro-Film Laboratory, ([19--?]) 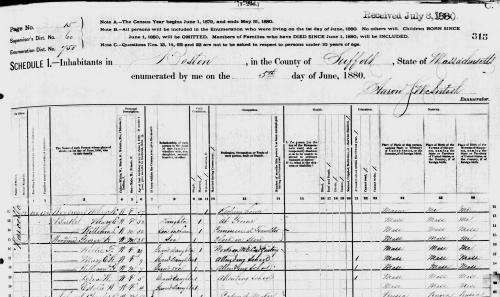 , Census Place: Melrose, Middlesex, Massachusetts; Roll: 925; Page: 6B; Enumeration District: 337; Image: 603.0. 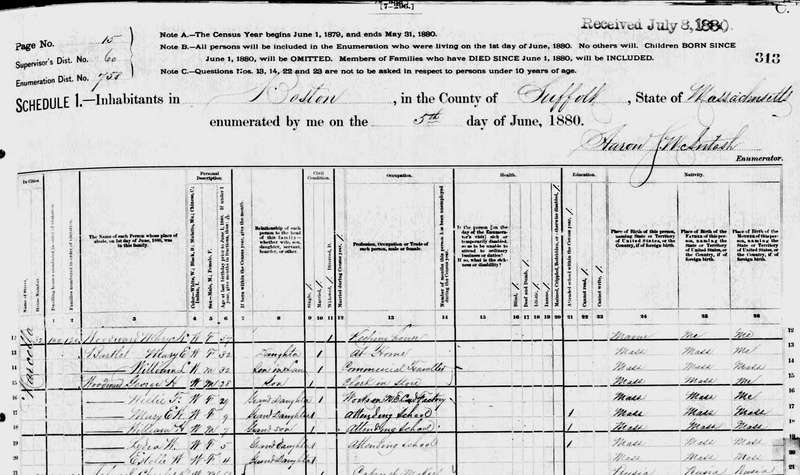 Sixteenth Census of the United States, 1940, Washington, D.C.: National Archives and Records Administration, (1940) , Census Place: Melrose, Middlesex, Massachusetts; Roll: T627_1613; Page: 12A; Enumeration District: 9-357. She was the daughter of Henry Augustus Woodward and Mary N. Frost. After her father's death her mother came to live with her in Newburyport, MA. Massachusetts Vital Records, 1841-1910, , Vol: 412 ; Page: 457.